Songwriter Jim Steinman, best known for baroque and dramatically verbose musical epics often belted out by Meat Loaf, has said in interviews that he would love to write 3-minute pop toe tappers, he just doesn’t know how. Filmmaker S. Craig Zahler can probably relate. 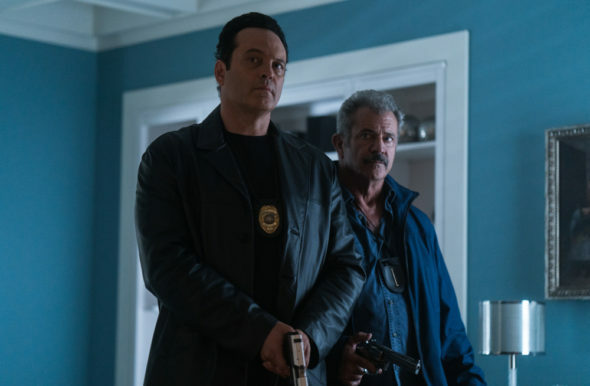 Dragged Across Concrete is his third feature as writer/director, and he’s still clearly invested in the long game. Like Bone Tomahawk and Brawl in Cell Block 99, Zahler’s latest is full of strangely indelible characters and memorable dialogue, a film anchored in creeping dramatic dread that finally explodes with wonderfully staged brutality. Brett (Mel Gibson) and Anthony (Vince Vaughn), street-smart cops in a fictional urban jungle called Bulwark, get popped when a bystander captures one overly zealous interrogation on video. A suspension without pay is something they’re forced to accept, but it isn’t long before Brett has a plan to make up for the lapse in funds with a little “proper compensation” on the side. But of course, they’re not the only ones looking for a score. Henry (a terrific Tory Kittles) is fresh out of the joint and needs money for his family. His old friend Biscuit (Michael Jai White) hooks them both up as drivers for a lethal bank robber (Thomas Kretschmann), and the long fuse to a standoff is lit. This is Zahler’s slowest burn yet, but he keeps you invested with a firm commitment to character, no matter the screen time. From a new mother with near-crippling separation anxiety (Jennifer Carpenter) to a loquacious bank manager (Fred Melamed) and a shadowy favor-granter (Udo Kier), nothing in the film’s 159 minutes feels superfluous. As Zahler contrasts the cops with the robbers, the sharply-defined supporters orbiting the core conflict only add to its gravity, despite a few moments than seem a bit too eager for Tarantino approval. Finally, the steady march of battered souls, desperate measures and eclectic soundtrack choices comes to a bloody, pulpy head, staged with precision and matter-of-fact collateral damage. Zahler’s command of his playbook is hard to ignore. Though the glory of Concrete‘s payoff never quite rises to the breathtaking heights he’s hit before, his confident pace and detailed observations make for completely absorbing storytelling.